Scientific research drives innovation, invention and discovery in our day-to-day life. The ability of today’s engineers to perform quantitative and analytic research in science and engineering is critical to shaping up tomorrow’s world. Great researchers and innovators were not born so, but were molded through their unique abilities of critical thinking, persistence, curiosity, observation and questioning skills, in addition to their deep domain knowledge gained through formal education. In order to improve the thought processes through identifying and delineating several important factors that are essential for creativity, CIR organized a guest lecture on “Towards Discovery, Invention and Research” by Dr.Sankar Sankararaman. He received his B.S. degree in Civil Engineering from the Indian Institute of Technology, Madras and recently obtained his Ph.D. in Civil Engineering from Vanderbilt University, Nashville, Tennessee, U.S.A. Currently, Shankar is a researcher with Stinger and Ghaffarian Technologies (SGT Inc.) at NASA Ames Research Center, Moffett Field, CA, where he develops algorithms for uncertainty assessment and management in the context of system health monitoring, prognostics and decision-making. He explained the concepts to Amrita students through a series of games, puzzles & riddles that are geared towards improving and gaining a better understanding of idea generation techniques, lateral thinking, importance of intuition & counter-intuition, thinking outside the box and correct questioning techniques. 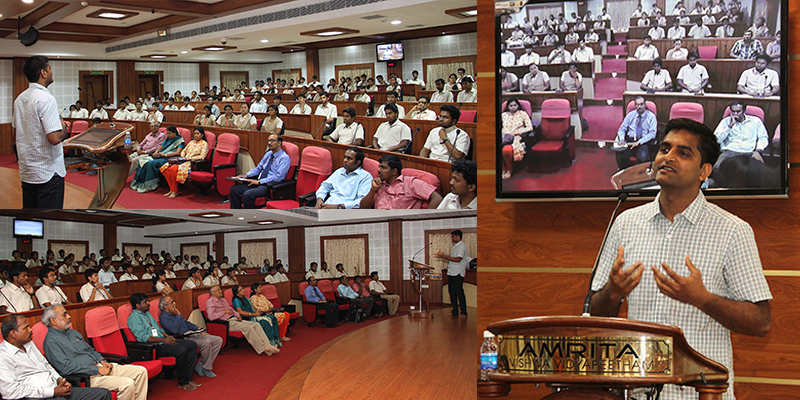 There was a overwhelming response from the students community for the programme.